As information technology (IT) has undoubtedly become crucial to world culture and the global economy, the demand for qualified professionals to operate, manage, repair, and troubleshoot IT continues to grow exponentially. According to the U.S. Bureau of Labor Statistics (BLS), IT-related occupations are projected to increase 6% between 2016 and 2026 due to a high volume of cloud computing, big data, and mobile computing needs within the technology sector. U.S. News and World Report ranked computer systems analysts among the best jobs of 2017; this and other occupations including software developers and IT managers were also named among the best technology jobs. As market demand grows and careers in IT only gain momentum, employers are ready to pay top dollar for qualified IT and computer systems/network employees. According to the BLS, median salaries for employees with a bachelor's degree in these fields range from just under $80,000 to more than $102,00 a year. More and more students are choosing to pursue an IT degree online because of the greater flexibility and affordability that a distance education can provide. 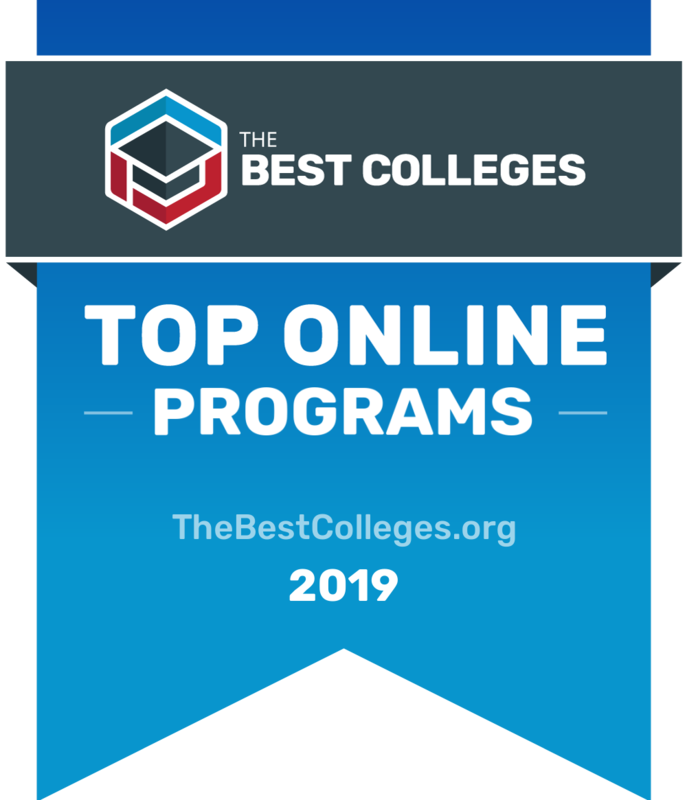 For anyone looking to earn an online information technology degree, we've put together a list of 2019's best online colleges and universities offering an IT degree online. Our online information technology degree rankings are based on several factors, including school reputation (rankings, awards, recognition), student satisfaction (retention and graduation rates), peer and instructional quality (student-teacher ratios and acceptance rates), and affordability (cost and financial aid). Only accredited colleges and universities were considered. The Purdue University system provides flexible and affordable educational opportunities to nontraditional learners through Purdue Global University. Those interested in information technology have several options, from certificate to master's degrees. Students begin their education with an Associate of Applied Science in Information Technology, which teaches a range of skills in areas such as database management and the installation and maintenance of computer and wireless networks. Purdue Global's Bachelor of Science in Information Technology empowers students with the concepts, tools, and technical expertise necessary to solve IT challenges. The ExcelTrack BS in IT is a competency-based education that allows students to complete the degree in an accelerated timeframe by earning credit for, and building on, existing knowledge. Students with a bachelor's degree in IT, computer science, or another related field may enroll in the Master of Science in Information Technology program to develop an advanced design and technology background. This program includes the study of systems analysis and design, and information systems security. It offers concentrations in business intelligence and analytics, information security and assurance, and project management. Walden University's online undergraduate program integrates expertise in the information technology and business fields. It is designed to help you form a solid foundation for long-term career growth and success in today’s global, IT-driven environment. This online degree program will help equip you with the technical skills you need to succeed in the field, while providing a strong understanding of key managerial and organizational concepts. Walden's BS in Information Technology is one of the few online programs accredited by ABET, the internationally recognized accreditor for college and university programs in applied science, computing, engineering, and engineering technology. Capella University offers an online IT degree at the bachelor's level in one of eight concentrations including business intelligence, healthcare management, project management, and more. The school also offers minors in fields related to IT, such as data analytics, data management, network technology, and system development. Students can transfer up to 135 credits towards their degree and pay a flat tuition rate each term to take as many courses as they like during a 12-week period. SNHU's information technology degree online coursework provides you with the chance to learn, practice and demonstrate your mastery of IT skills with the latest innovative online tools. Build your technical abilities and gain the professional skills you need to become a leader in IT with an online bachelor's in information technologies at Southern New Hampshire University. Our information technology degree online program begins with the fundamentals of information technology and culminates in advanced courses in system design and implementation, preparing you for a challenging but rewarding career in IT. Keiser University's online information technology degrees include an associate of science in information technology and a bachelor of science in information technology management, the latter designed as a completion program for graduates of AS programs in computer-related fields. Coursework within the undergraduate online degrees incorporates broad, introductory curriculum for entry-level computer technicians and information technology professionals, as well as those aspiring to supervisory or managerial positions in the field. American InterContinental University offers numerous online information technology degrees, including an online bachelor of science in IT and master of science in IT in various specializations. All programs are designed to provide students with the technical skills that may help students succeed in the field, as well as to potentially pursue further specialization. The programs also provide a strong understanding of key managerial and organizational concepts. The bachelor's program offers four specialization options: digital investigations, information assurance and security, network administration, and software analysis and development. Students in the master's program may choose one of two specialization options: IT project management or information assurance and security. South offers both an undergraduate and graduate online IT degree. The Bachelor of Science in Information Technology and Master of Science in Information Systems provide students with a foundation for understanding the function and process of computer programming, database design, network design, information security and software engineering. Case studies and relevant projects further prepare students for the technology-dependent workplace. Available specializations may include database development and administration, information systems security, network administration and management, and multimedia and web development. At Western Governors University, students can choose from numerous online IT degrees, at both the bachelor's and master's level. Undergraduate students can choose to major in a concentration such as network administration, data management or software development, among others, while graduate students may choose an MS in cybersecurity and information assurance, data analytics or information technology management, or a Master of Business Administration in Information Technology Management. WGU is a member of the Microsoft IT Academy, and as such, students at WGU can take advantage of coursework from Microsoft; the cost of certification exams is included in the WGU tuition price for Microsoft IT students. Colorado Technical University offers one of the largest selections of information technology degrees online. The university offers bachelor's programs in information systems management and cybersecurity, as well as a Bachelor of Science in Information Technology in at least seven unique concentrations. Students enrolled in the online Master of Science in Information Technology may choose from one of four field specializations. CTU's specialized, in-depth curriculum and hands-on labs prepare students to tackle the hard-hitting IT problems of today and tomorrow, and a problem-based learning approach helps incorporate the complete set of real-world business skills the industry demands. CTU programs offer connections to over 70,000 alumni and proven industry experts help students expand their skill set and grow a powerful professional network. Post invites students to enhance their IT professional development through the online bachelor of science in computer information systems in one of three available concentrations: computer networking, cybersecurity, or software development. Our carefully configured set of courses combines IT theory with practical information and technology business experiences. Graduates are prepared with the skills necessary to competitively administer tech-driven business, communicate effectively, and work efficiently as part of an enterprise business team. Founded as a technology training school, Herzing University has 50 years of experience preparing graduates with degrees in technology for successful careers within their specialty. The university offers information technology online degrees in IT/networking, software development, and technology management, as well as certificate-to-degree programs. Online IT degrees allow students to learn from faculty who have the credentials and experience to prepare them for exciting careers in computer science, software development, networking and security, drafting, electronics, and technology management. Diverse hands-on coursework, and state-of-the-industry software and equipment is designed to provide students with the right skills for long-term career success. Graduates who earned a computer information technology degree online may be qualified for a broad variety of technology jobs, working with complex computer systems in an expanding, multifaceted field. The BLS outlines numerous occupations available to IT-educated candidates -- most requiring an undergraduate degree as the minimum requirement for entry-level employment. For example, career options for graduates of an online bachelor's degree in information technology include computer and information systems managers, computer hardware engineers, and software developers -- all among the top three highest-earning positions in the field. Some computer support specialist and web developer jobs may only require an associate degree for initial employment, while graduate-level education and/or specialty training can set candidates apart with a competitive edge. Many careers in information technology offer above average salaries. The longer you work in IT and the more certifications and experience you accrue, the higher your potential income can go. Earning your IT degree online can jumpstart this process by allowing you to get started in the field while you're still taking classes. There are IT jobs in many fields, which offer different average salaries for information technology graduates. Working in the nonprofit field, for example, could pay less than the tech industry. Also called IT managers or IT project managers, these professionals are responsible for guiding and implementing all computer-related tech activities for a business or organization. These professionals are responsible for many of the advances in computer technology, as designers, developers, and testers of major computer systems and components. Professional computer network architects are responsible for designing and building data communication networks, such as LANs, WANs, and intranets. Programmers are experts at writing and testing code used to develop functional computer applications and software programs. Support specialists help individuals and organizations to troubleshoot and resolve issues with computer equipment and/or software. These professionals help to develop efficient and effective information systems solutions by studying an organization's current tech operations and improving upon them. Database administrators are experts in the organization and storage of data through specialized software that is both accessible to authorized users and protected from unauthorized access. These professionals design and develop electronic equipment, as designers, developers, testers and supervisors of the manufacturing process. Information security analysts are responsible for developing and implementing security programs to protect sensitive information against cyberattacks within an organization or company, or for an individual. These professionals are among the most creative positions in IT, designing and developing both the systems and networks that host software and applications, as well as the software and applications themselves. Web developers are responsible for designing and building websites, often addressing both aesthetic and technical aspects of the site as well as creating the content that will be posted there. For some students aspiring to a high-level career in IT, earning an advanced degree is a lucrative decision that can set them apart from other similarly qualified candidates. In a 2017 survey conducted by Computerworld, 43% of IT managers expected their staffs to expand this year and 66% of the same managers are seeking highly skilled specialists for open positions. Graduates of advanced IT degrees with specialized skills in a niche area such as user experience (UX), application design, or cloud computing may be eligible for top positions at well-known organizations, earning one of the highest salaries in the field. Additionally, earning IT certification as a Cisco Certified Network Associate (CCNA), CompTIA A+, or Network+ Technician—currently the most in-demand certifications among hundreds available in the field—may be especially attractive to some employers. Candidates with information security experience may also see an increase in demand in the coming years, now that ISPs can sell members' browsing data to third parties. Once you've done your research to find a specialization that fits your skills and interests, make sure the school you are considering offers your concentration of choice or will allow you to customize your degree to create your own major through interdisciplinary coursework. With so many career options available in niche areas of IT, you'll want to make sure your education matches the particular occupation you aspire to after graduation. While education programs in this field are typically career-oriented by nature, a good IT program should always offer extensive training in the practical skills that will be required of you once you're on the job. Many schools offer specialized training and/or certification in specific hardware, software or applications; better yet, some schools incorporate certain certification training into degree coursework and are authorized as an official provider of certification for select programs like the Microsoft IT Academy. By the time they apply for an online degree, some IT students may have completed previous credits through an associate degree, individual coursework or certificate program. For those with previous credits, selecting a program that clearly states its credit-transfer policy is key. Ask to speak with an admissions advisor or enrollment counselor to make sure you can apply maximum credit for previous skills toward a future online IT degree. As with any online program, convenience and affordability are among the biggest attractions for career-minded students looking to enter the field of IT. Online programs allow aspiring IT professionals with full-time jobs and family obligations to work from home, at their convenience; Most online IT degrees also provide deep discounts for distance learners, allowing students to save on tuition costs and, in many cases, complete their degree sooner than an on-campus degree. What Else Can I Expect From an Online Information Technology Degree Program? Online information technology degrees vary from school to school, but some themes, subjects, and courses come up often. Although technology evolves quickly, the best online information technology degree programs will address some of the most important issues in the field to prepare you for a successful career. Systems Analysis and Development: Courses like this provide the foundational analytical and design skills needed to develop business systems and applications. Such courses cover software development lifecycle and other factors that are necessary for presenting developments to clients outside of IT. Emerging Technologies and Issues: Technology is constantly changing and developing, and IT professionals must stay current on such developments. This course looks at the emerging technologies and discusses methods for adapting to future, unforeseen changes in the IT landscape. Enterprise Models: Courses that focus on enterprise models investigate how organizations use information technology to help make operations run more smoothly. A variety of systems are used and developed in business settings, such as supply chain management and customer relationship management, and are increasingly inseparable from day-to-day operations. Security and Ethics: Data security in IT is an important subject, one on which billions of dollars are spent each year. The kinds of systems that can be used to ensure security of information, as well as what kind of ethical concerns come along with the collecting, storing, and sharing of data is covered in such courses. CIS Project Management: No matter how many people are on a project or team, anyone building a career in IT should have some familiarity with how to manage projects. Failing to properly plan out and maintain projects can lead to significant budgetary problems, and courses like this help keep those problems from happening in the first place. How Long Does It Take to Get an Online Information Technology Degree? Most master's degrees require about two years of full-time study. What counts as full-time versus part-time study can vary from one school to another. Some programs follow intensive plans, wherein students take more credits per semester than the average; others have shorter, more packed courses, which allows students to earn their degree quicker. Individual and cohort learning options are common among the best online information technology degrees. Individual learning is the more common form, in which students choose the courses they wish to take each semester. This lets you set your own pace and schedule courses around your life. Cohort learning sets a group of students on the same path with a set schedule of courses over the length of the program. These are often intensive programs that take less time than individual programs. MCSA: Microsoft Certified Solutions Associate is an entry-level certification that proves that the holder possesses the skills needed to work within the IT field. This certification requires passing two exams and is required to earn the more advanced Microsoft Certified Solutions Expert certificate. CompTIA Network+: The Network+ certification promotes careers in IT infrastructure by ensuring that holders are well-versed in troubleshooting, managing, and configuring wireless and wired networks. This is an exam-based certificate offered by CompTIA, one of the world's leading technology associations. They provide several other certifications as well. CCNA Cyber Ops: Provided by Cisco, this certification proves that the holder knows how to manage security systems, protect organizations from breaches, and respond to cybersecurity threats. It requires passing two exams, for which Cisco provides self-directed or instructor-led training courses. Earning this certificate can open up further, more advanced options. Getting a computer information technology degree online can be expensive, but there are several ways in which students can help pay for their education. Financial aid, from federal, state, or private sources, is quite common. Filling out the Free Application for Federal Student Aid (FAFSA) is highly recommended, as this determines eligibility for federal grants, loans, and work-study awards. Scholarships and fellowships are another option, and some companies will agree to pay some of the cost to further educate their employees. There are many scholarships available to IT students, some of which are geared toward information technology online degrees, as well as to certain universities or populations. You can find several examples below to get you started in your search. For some students aspiring to a high-level career in IT, earning an advanced degree is a lucrative decision that can set them apart from other similarly qualified candidates. In a 2017 survey conducted by Computerworld, 43% of IT managers expected their staffs to expand this year and 66% of the same managers are seeking highly skilled specialists for open positions. Graduates of advanced IT degrees with specialized skills in a niche area such as user experience (UX), application design, or cloud computing may be eligible for top positions at well-known organizations, earning one of the highest salaries in the field. Additionally, earning IT certification as a Cisco certified network associate (CCNA), CompTIA A+, or Network+ technician -- currently the most in-demand certifications among hundreds available in the field -- may be especially attractive to some employers. Candidates with information security experience may also see an increase in demand in the coming years, now that ISPs can sell members' browsing data to third parties. Information technology and computer science programs are often similar in their content and approach, but not identical. Each type of program typically offers unique coursework aimed at providing students with the skills they need to succeed in a particular sector of the field of technology. Generally, computer science professionals are, in fact, actual scientists, adept at using math and algorithms to understand why computers operate the way they do as well as being able to communicate with computers through reading and writing code and learning to "speak their language." By contrast, information technology professionals are more focused on using computerized technology, analyzing operating systems, software systems and computer networks to provide more functional solutions for businesses, organizations, and individuals. Due to the nature of the work, IT professionals typically have more direct interaction with clients and interdepartmental staff than their computer science counterparts. To determine the best online Information Technology (IT) programs, we looked at the most important factors prospective students, mainly common predictors of future success and a school's commitment to online programs. This boils down to admissions rate, student loan default rate, retention rate, graduation rate, and the percent of students enrolled in online classes. All data points are taken from information provided by colleges and universities to the National Center for Education Statistics. Each factor is weighted evenly in order to give an objective view and determine the 9 best online Information Technology (IT) programs. To calculate our rankings, we looked at a school's ranking when organized by a single factor, and then averaged each category's ranking to find an overall score: Admissions Rate (20%) + Default Rate (20%) + Retention Rate (20%) + Graduation Rate (20%) + Percent of Students Enrolled in Online Classes (20%) = Final score.